It’s a bit cro-magnon, to be sure – a monosyllabic utterance that doesn’t express dismay, but rather curiosity. That three-letter grunt is the signal that my brain is working something over, trying to align my expectations for the disc’s flight with its actual performance. In essence, “huh” means the wheels are turning. I guess when you can package something a noodle arm can actually throw into a whopping speed 15 package, “wow” is well-deserved. The Raketen, which means “rocket” in Swedish, is Latitude’s newest creation, a more understable take on the company’s recently released Missilen. Touching the rarified air of speed 15, it pushes the envelope not by exceeding PDGA standards for rim width, but instead by relying on a textured mold that, according to the company, reduces drag. Dimples have been done before. Obviously, our game’s spherical cousin, the golf ball, sports them in spades, and A.C. Slater used his to make the ladies of Bayside High get so excited that they subsequently became so scared. 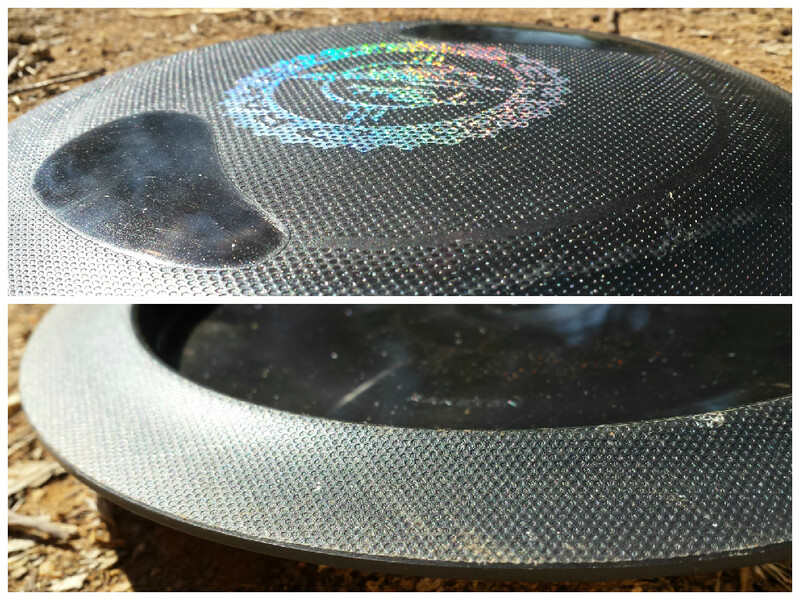 In disc golf, though, the dimpled disc has heretofore been relegated to novelty status. Yes, Quest Applied Technologies gave the idea a shot with various molds, but that brand isn’t exactly viewed as the gold standard of flight execution; it’s more toy water rocket than NASA space shuttle. Suffice to say, then, when Latitude 64 announced the Missilen earlier this year as the first in its Opto Hex line of discs, the trepidation was tangible. Since I’m a noodle arm, though, I stayed away from the Missilen once reports surfaced of its overstability. Sure, it was new and fast, but I knew it wouldn’t be a fit for me. And, truth be told, the Raketen didn’t really pique my interest at first, either. Yes, “an extremely fast, long distance driver” sounds nice in theory. But when the company admits that “at the same time, you will lose a bit of the glide,” my spidey senses don’t exactly tingle, if you know what I mean. When my tester from Dynamic Discs arrived in the mail, though, my tune changed immediately. The Opto Hex plastic that the disc features amounts to hexagonal dots, much like a golf ball’s dimples, being pressed into the disc all over the top of the flight plate and extending to the underside of the rim. However, there are a couple spots where the pattern is absent, mostly importantly in two amoeba-like shapes on either side of the flight plate that act as thumb grip pads. As a left-handed thrower, I appreciated that Latitude 64 put enough thought into this design to add one pad on each side of the disc pointing in opposite directions – like separated yin and yang symbols – so that I would not be left without the benefits of the mold’s ergonomics. My thumb fits the pad perfectly, and it gives a nice, grippy area to press down that contrasts with the slicker dimples. The flight plate of the Raketen features two thumb pads (top) for grip, while the hexagonal dimples cover the underside of the rim (bottom). The leading edge of the disc’s rim, as well as the underside of the flight plate, are also devoid of dimples, and this makes sense from a flight standpoint. Adding the hex pattern to those regions would make the disc near flightless, I imagine, as the drag would be too great to really allow the disc to gain any loft. These were subtle points, but they gave me the comfort that the designers at the Latitude factory truly put some science into their efforts, making the Opto Hex concept more than just a novelty. Thinking back to those first couple of field throws with the Raketen, I am still surprised at how impressively the disc flew. There’s a little greenbelt near my house that I use to test new discs, and I have a general idea of how far various markers stand from different throwing spots. I don’t usually give anything 100% effort out there, mostly due to the fact that I don’t want to lose control of a disc and have it go crashing into the neighbor’s yard, but I usually get a feel for how something will perform at max speed. Why is this relevant? There’s a bridge that, according to Google Maps, is 320 feet from one of my throwing spots. It always seemed unattainable, because a disc has to travel a relatively straight line to hit it, and that’s close to the top end of my distance range. I had never reached that bridge until I threw the Raketen. Put on a mellow anhyzer angle, the Raketen held a nice, long, smooth turn for about 85 percent of its flight before fading and landing just left of the wooden overpass. It was an absolute bomb, and it showed me this disc’s capacity. I was able to execute that same line on the course, with similar distance success. Hole 2 at Kit Carson Park has a pin position tucked back and to the left of some trees, where a double mandatory requires the disc stay within a 50 foot gap. It’s a large enough opening, to be sure, but coax too much turn out of a disc and you miss the mark, leaving you to find the drop zone or, in the best case scenario, in a prison of trees. I put the Raketen on the same anhyzer angle as at the park, then watched it hold the turn and flex out nicely at the end for increased distance. As I played with it more, I also came to see that Latitude has, in my opinion, underestimated the amount of glide this disc really has. It’s not just a one-trick, anhyzer-only pony, though. On a clean, flat throw, the Raketen still holds a remarkably straight line with a small ending fade. Even on pure hyzer shots, the disc holds the line and sits down without skipping too far off course. For such a fast disc, it has surprisingly little lateral movement, which gave me the confidence to throw it down longer, tighter fairways. As I played with it more, I also came to see that Latitude has, in my opinion, underestimated the amount of glide this disc really has. True, it does not possess the same level of pixie dust magic as most discs from the Swedish factory, but a glide number of 3 makes me think of something that just runs straight to the ground – like a Dynamic Discs Felon or Latitude 64 Spark – when it leaves your hand. The Raketen, on the other hand, can get some extended distance with control, and if I can throw it 320 feet it certainly has more than a 3 on the glide scale. I would rate it closer to a 4.5; it’s in line with most non-Latitude molds in terms of how long it’ll remain aloft. On the whole, then, I give the Raketen the Noodle Arm stamp of approval. However, there will be people who will tell lower-powered players not to throw this disc because they won’t truly be able to unlock the potential of a speed 15 mold. And maybe they’re right. There are a couple rules, though, that I generally adhere to as a noodle arm. Beginner Tip number three on this very site advocates to throw what gets you to the basket, and the Raketen can certainly give you exrta distance, especially when worked on an anhyzer. But there’s another, unwritten guideline that I also follow: throw what maximizes the fun. The Raketen, with its unconventional hexagon pattern and rocket-fueled distance potential, maximizes the fun. It’s that simple. Ride it high as a kite. 2) LIKE Latitude 64 – Golf Discs. The contest will run until Wednesday, June 24 at 9 p.m. PDT, when a random winner will be chosen. Thanks to Dynamic Discs for providing the plastic! I picked one of these up yesterday. To me it feels like a beefy boss. Immense sidearm shots. Back hand as well. I love my Raketen’s!! Greatest disc I’ve thrown. I’m a forehand “flicker” and I’m bombing the course with theseI things!! I backhand them also but my forehand is so much stronger. To get the best performance I think is to really get a whipping tourqe type motion. But I also throw them gently with anny or hyzer and they float pretty nicely.